Take a 3-day trip from Bangkok to Kanchanaburi province, stay in floating raft hotel and visit the famous River Kwai bridge! Please note: we do not offer this trip in isolation. It is arranged as part of a complete tour. After an early breakfast, we set off by road for Kanchanaburi province (about 2 hours). 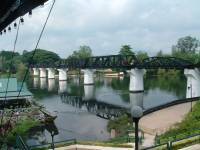 On arrival, we visit the War Museum, the war cemetary and the bridge over the River Kwai. 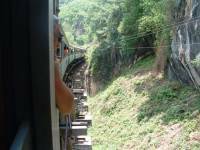 Then we board the 'Death Railway' for a trip to the end of the line, followed by lunch. After lunch we take a long-tail boat up river to check in at the Jungle Rafts. Later, you can chill out at the Jungle Rafts or visit the nearby Mon village where you can try elephant riding (extra cost option). Dinner & accommodation at Jungle Rafts. After breakfast, take a boat ride upstream to visit the Saiyoke Yai National Park, visiting the waterfall to experience nature at its best. 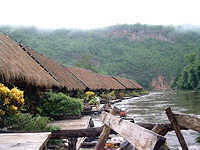 Return for lunch at Jungle Rafts, then check out of Jungle Rafts and take the boat to the Resotel. Afterwards, visit the Lawa Cave and explore the fascinating rock formations. Dinner and Accommodation at Resotel. This morning we take the boat to the Resotel pier, then visit the famous 'Hell-Fire Pass' and the nearby war museum. Return to Resotel for lunch. After lunch, check out of Resotel and depart for Bangkok (3 hours).